There are many great things about Scotland (the buildings of Charles Rennie Mackintosh, Edinburgh festivals, everything the city of Glasgow has to offer...), but top of the list is easily treats by Tunnock's. 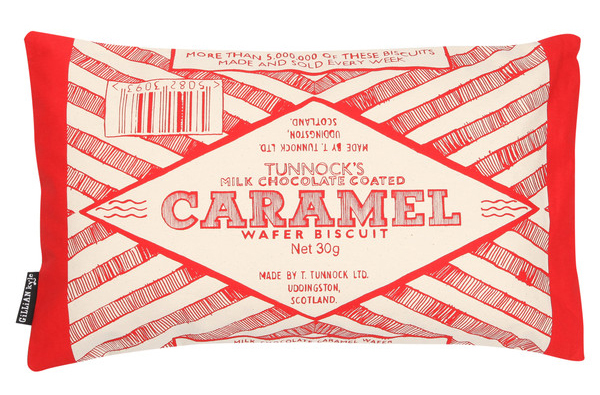 A family-run company based in Uddingston just outside Glasgow, Tunnock's have been making delicious Caramel Wafers, Snowballs and more since 1890 (read about their past and present in this fab piece over on the Telegraph website). Their pièce de résistance is the Teacake, a chocolate-covered mallow biscuit that I can't believe I'd been living without for so long. How did I ever survive?! 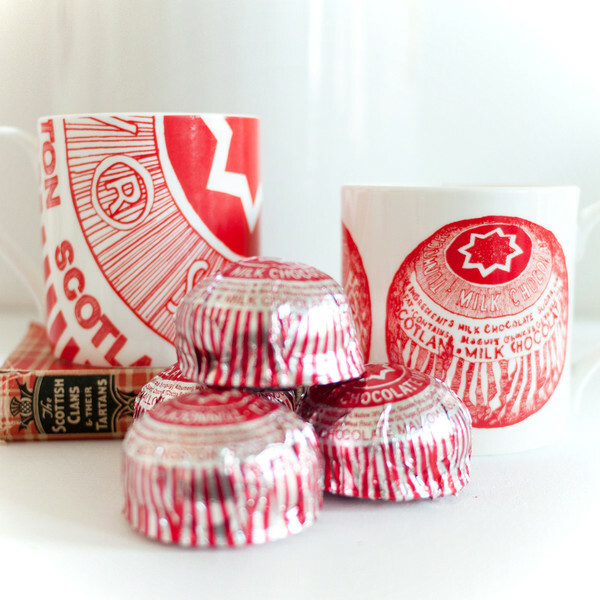 Celebrating these and other iconic Scottish food, drinks and historical figures is Gillian Kyle, a Glasgow-based textile designer. She's made a host of work from her Local Heroes (and Villains) range of homewares celebrating people such as Charles Rennie Mackintosh (and his super-tache) and Bonnie Prince Charlie to a recent collaboration creating products for Glenfiddich whisky. 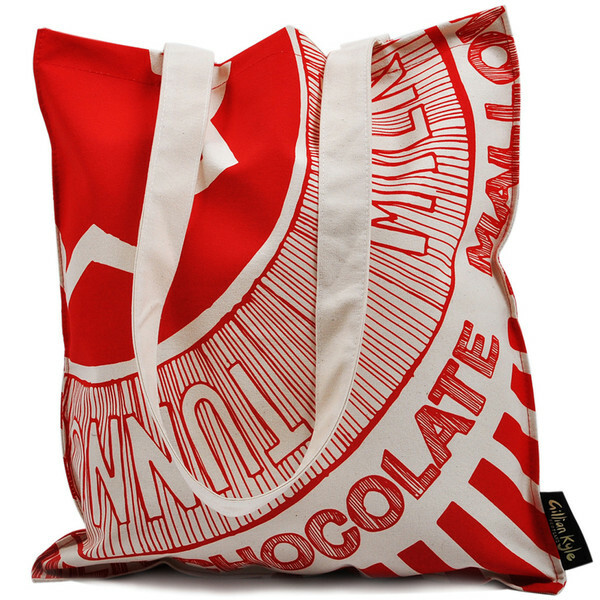 But the crowing glory in her body of work has to be her Tunnocks-inspired textiles, mugs and cards. 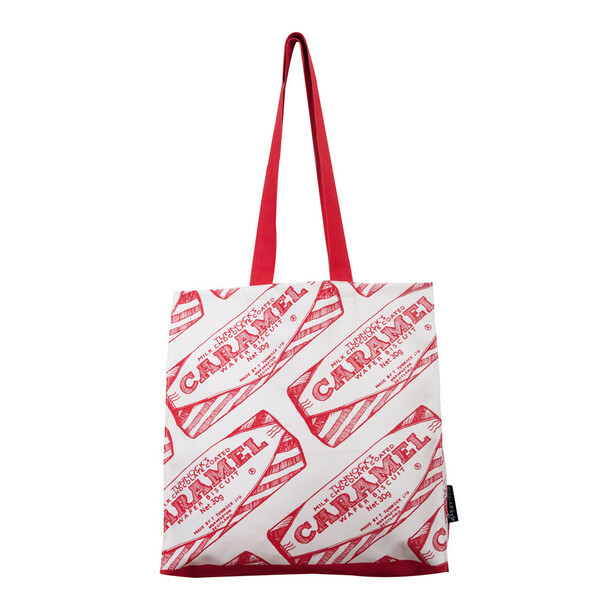 The latest addition to the range is the Caramel Wafer cushion, pictured above.